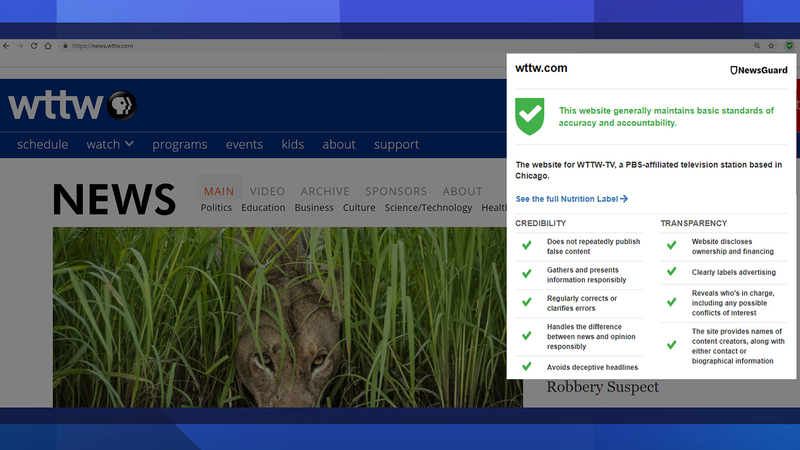 How can readers know whether a news site is trustworthy? There’s a web browser plug-in to help determine just that. The tool comes from NewsGuard, a start-up comprised of analysts, journalists and former editors who take a deep dive into news sites to determine whether they are credible. “NewsGuard is basically an attempt to spread media literacy, have people start asking themselves critical questions about the things they’re seeing online and ultimately fight disinformation and stop the spread of false news,” said Sarah Brandt, vice president of news literary outreach at NewsGuard. Analysts review each site based on nine criteria that carry differing point values, i.e., “Does not repeatedly publish false content” (22 points), or “Clearly labels advertising” (7.5 points). A website with a score of less than 60 points will be rated red for disapproval; a site that scored 60 points or higher will be marked green, meaning it follows basic standards of accuracy and accountability. After analysts determine scores, each site receives a “Nutrition Label” that explains how they came up with that score. Readers can view scores after downloading a web browser extension that includes green, red, orange (satire sites), blue (informational sites) or grey (review in-process) markers next to links and headlines. Brandt and James Warren, executive editor of NewsGuard, join us in discussion.